Get 24/7 protection at no extra charge. Bundled with your Spectrum Business Internet service, this robust software package is ideal for protection your business from viruses, spyware, adware, and more. Get started today by registering and secure the computers you rely on for everyday business. Spectrum Business will not provide any warranty or have any liability relating to your use of the McAfee Software. 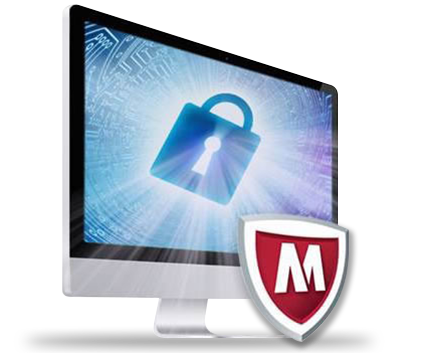 Your download and use of the McAfee Software will be subject to an End User License Agreement required by McAfee. Subject to change without notice. Some restrictions apply. McAfee, the McAfee logo, McAfee Family Protection, McAfee Total Protection, and McAfee Internet Security are registered trademarks or trademarks of McAfee, Inc. or its subsidiaries in the United States and other countries, Other marks and brands may be claimed as the property of others, The product plans, specifications and descriptions herein are provided for information only and subject to change without notice, and are provided without warranty of any kind, express or implied. Copyright 2012 McAfee, Inc.
Products & Services not available in all areas.